V2WORK – “Strengthening the Vietnamese Higher Education System to improve graduates’ employability and entrepreneurship skills” – is a 3-year Erasmus+ project co-financed by the European Commission, whose aim is to strengthen the capacities of the Vietnamese HE System to improve the employability & entrepreneurship skills of its graduates, and to reinforce its relationships with the labour market. Read more. The V2WORK project held its second training of trainers module at the Industrial University of Vinh, in Vietnam. 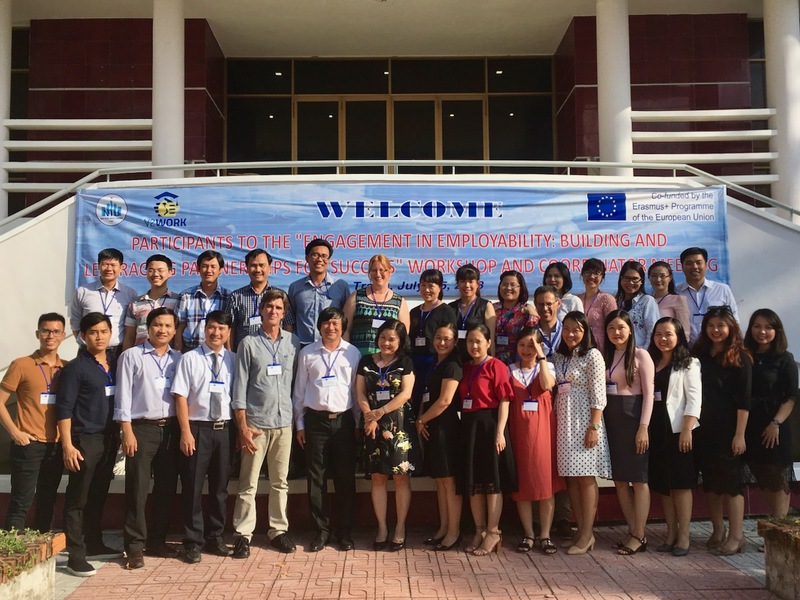 The module, for Career Centre staff from eight universities in Vietnam, was delivered by staff from the University of Alicante and the University of Coimbra, with a special contribution on the Vietnamese labour market by the University of Social Sciences and Humanities in Ho Chi Minh, from October 16th to 18th, 2018. The first V2WORK training module for university Career Centre staff took place from July 2nd to 4th, 2018, at Nha Trang University in Vietnam. 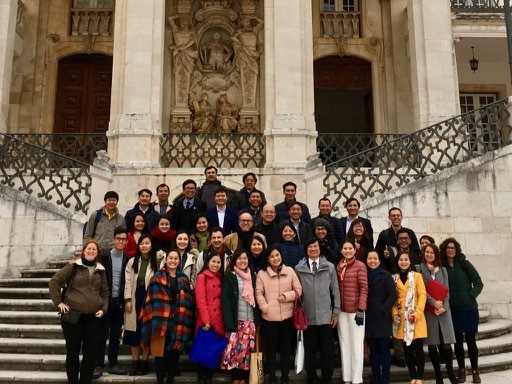 Following the project Kick-off meeting, V2WORK partners from 8 Vietnamese universities, the Ministry of Education and Training, the Vietnam Chamber of Commerce and Industry from Ho Chi Minh City and the student association AIESEC, participated in a 2-day study visit at the University of Coimbra (UC) in Portugal. 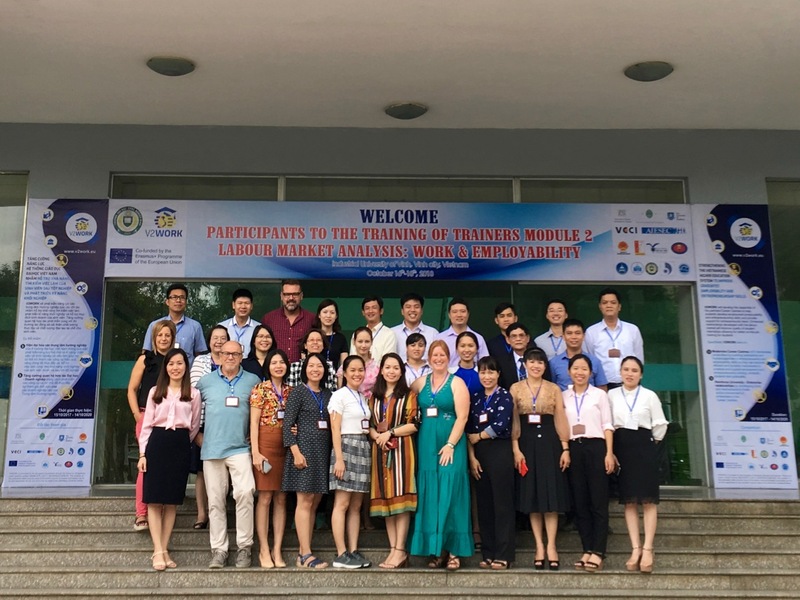 The module is hosted by Tra Vinh University, from April 3rd – 5th, 2019. The objective of fourth V2WORK training of trainers module is to make participants familiar with the purpose and the processes related to soft skills and internships of university students. This third V2WORK training of trainers module is centered on supporting students and graduates in acquiring entrepreneurship skills and supporting their entrepreneurial endeavours, as well as understanding the influence of an HEI’s entrepreneurial culture and marketing initiatives. Stay up to date on V2WORK - subscribe to our newsletter. V2WORK is co-financed by the European Commission through the Erasmus+ Programme, under contract number 586252-EPP-1-2017-1-ES-EPPKA2-CBHE-SP. The contents of this website reflect only the views of the authors and the European Commission cannot be held responsible for any use which may be made of the information contained therein.